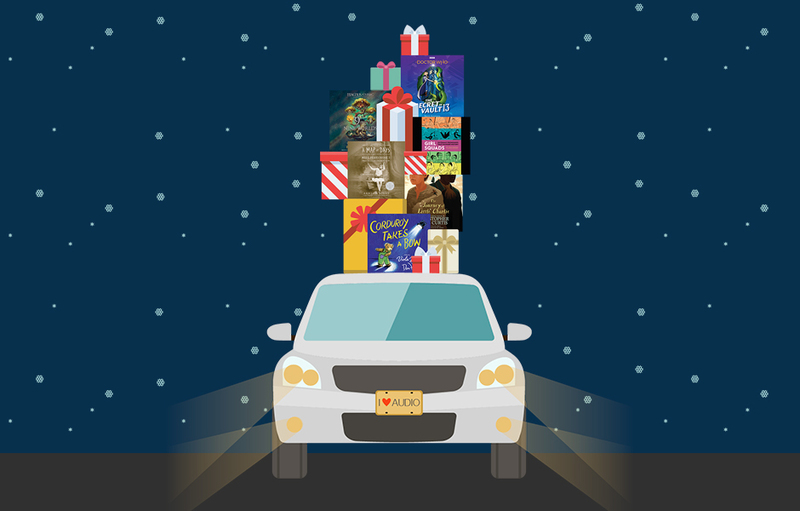 Make Holiday Travel Fly By With Audiobooks! Holidays mean visiting with old friends, eating an abundance of delicious food, and watching the snow fall from inside a cozy house. But sometimes the road to these delightful get-togethers is long, and can be less than relaxing with a full car. Thankfully, we’ve found a selection of audiobooks that every member of your holiday caravan will enjoy—and that will make the miles fly by! To discover your story, visit our Holiday House, which is chock-full of audiobooks that will help you and your family make the most of your holiday road trips. Happy listening to all, and to all a good drive! Having defeated the monstrous threat that nearly destroyed the peculiar world , Jacob Portman is back where his story began, in Florida. Except now Miss Peregrine, Emma, and their peculiar friends are with him, and doing their best to blend in. The stakes are higher than ever as Jacob and his friends are thrust into the untamed landscape of American peculiardom—a world with few ymbrynes, or rules—that none of them understand. New wonders, and dangers, await in this brilliant next chapter for Miss Peregrine’s peculiar children. A modern girl needs her squad of besties. But don’t let all the hashtags fool you: the #girlsquad goes back a long, long time. In this hilarious and heartfelt audiobook, geek girl Sam Maggs takes you on a tour of some of history’s most famous female BFFs. Spanning art, science, politics, activism, and even sports, these girl squads show just how essential female friendship has been throughout history and throughout the world. Sam Maggs brings her signature witty and warm voice to the audiobook as she pays tribute to the enduring power of the girl squad. The Magnus Chase and the Gods of Asgard trilogy may have concluded, but we haven’t heard the last of our favorite peeps from the Nine Worlds . Listen in to the medley of voices that make up the gang, like Hearthstone, Blitzen, Samirah, Alex, Jack, T.J., Mallory, Halfborn, and more on a hilarious and unforgettable journey through Rick Riordan’s unique take on Norse mythology. While Magnus is away, our cast of characters find themselves in some sticky, hairy, and smelly situations as they try to outwit moronic giants, murderous creatures, and meddlesome gods. When Lisa takes Corduroy to the theater for the very first time, it’s so magnificent and exciting that he just can’t help heading out on his own to explore. From the orchestra pit to the prop table to the dressing rooms, Corduroy sees it all. Could there be a place for Corduroy on stage, too? Author and narrator Viola Davis uses her own experience—and her own voice—as an Emmy, Tony, and Oscar Award-winning actress to imbue Corduroy’s adventure with all the magic of the stage. Twelve-year-old Charlie is down on his luck: His dad just died, the share crops are dry, and Cap’n Buck has come to collect a debt. Fearing for his life, Charlie strikes a deal with Cap’n Buck and agrees to track down some thieves. It’s not too bad of a bargain for Charlie…until he comes face-to-face with the fugitives and discovers that they escaped slavery years ago and have been living free in Detroit. Torn between his guilty conscience and his survival instinct, Charlie needs to figure out his next move–and soon.